Edinburgh Weavers was founded in 1928 by the textile manufacturer James Morton (1867-1943) as an experimental design and marketing unit of Morton Sundour Fabrics. Originally based in Edinburgh, the firm merged with Morton Sundour Fabrics' weaving factory in Carlisle in 1931. 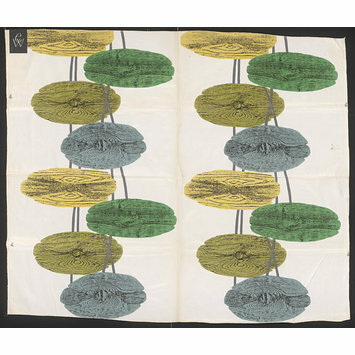 They achieved success in the UK and US under the enlightened directorship of Alastair Morton (1910-63), who commissioned freelance designers and artists to produce work for interpretation as printed and woven fabrics. Following Alastair Morton's death, Edinburgh Weavers was taken over by Courtaulds in 1963. Satin weave cotton, printed, machine sewn top and bottom edges, "ew" logo on both selvedges, design of oval shapes like water lily pads, greens on white ground. Two repeats in width. Woven ew label : " S.P.26124/name Pavanne/no. 0782/646/40/ Finished Particulars / (a) warp Egyptian cotton combed and gassed weft American carded cotton / (b) warp 140 ends per inch 2/60s counts / (c) weft 44 picks per inch 7s counts / (d) weight per sq. yd. finished 7.8 ozs / (e) manufactured in England / (f) dyestuffs vats (not less than 6) ". The Courtaulds Design Library principally contained records from Courtaulds’ factories at Halstead and Bocking, Essex, and Halifax, and the large collection that came into Courtaulds’ possession through its acquisition of Morton Sundour and Edinburgh Weavers in 1963. The library was used by designers within Courtaulds and was also available for the use of Courtaulds’ customers. 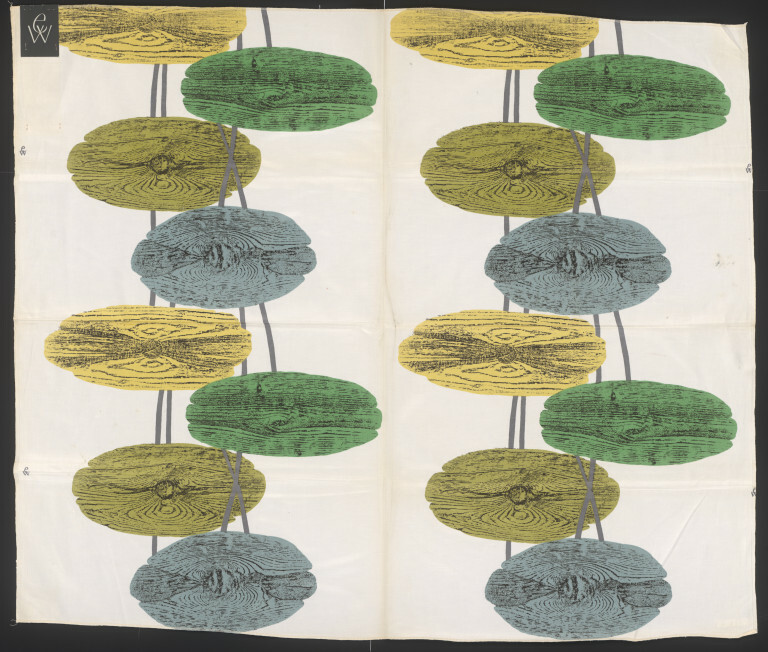 Following the acquisition of Courtaulds by the international corporation Sara Lee and the subsequent change in the business it was decided that the V&A would be the most appropriate location for the collection to enable it to be appreciated and used more fully. The Library was donated to the V&A by Sara Lee Courtaulds in 2001.